Thickened stainless slide bar adopts streamlined design and thick material to prevent hidden danger of cutting hand.It builds a good hand-held arc of ergonomics, which is able to stand the test of time. The revolving hand adjusts the height of the shower bracket up and down. Adjustable shower bracket can adjust the angle of the handheld sprinkler. Brushed nickel treatment prevent scraping, clean easily and it is difficult to rust. 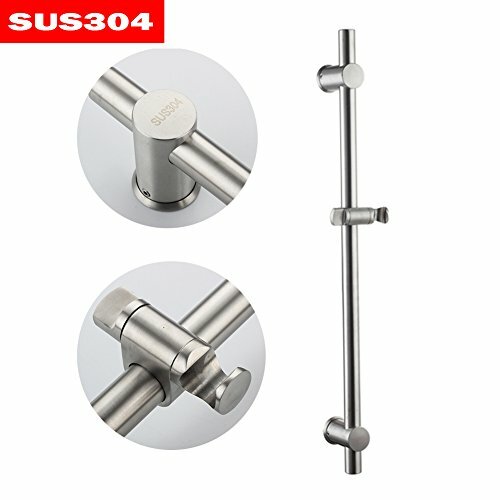 Constructed of Type 304 Stainless Steel, build to resist scratches & corrosion & rust, ensuring quality and longevity. The Neady slide bar works with any handheld shower or shower combo. Allows each user to use handheld shower hands-free at their desired height and angle. Height/angle adjustable handheld shower bracket can be setting for any height and any angle. Wall-mounted installation, hardware pack included. Classic, sensible styling that complements any home.